Under the Texas Labor Code, employers and labor unions are prohibited from requiring Texas employees to join a labor union or pay union membership dues as a condition of employment. While the statute – which is commonly referred to as a right-to-work law – protects employees from compulsory union membership, existing law does not fully protect workers during union elections. Specifically, Texas law does not currently guarantee workers a right to cast their unionization vote by secret ballot. When union organizers approach a group of employees seeking to unionize their operations, an election must be held before the labor union is authorized to serve as the workers’ exclusive collective bargaining agent. However, rather than base the election on traditional secret ballots, union organizers often employ a system where workers sign a non-confidential form or card that reveals which individuals supported the unionization vote. The bill proposed by Sen. Seliger and Rep. Anderson seeks to protect workers by guaranteeing a right to cast a unionization vote by a secret ballot. If passed, the law not only would require that the election of exclusive bargaining representatives be determined on the basis of a vote by secret ballot, but also that a majority of affected workers actually votes to support unionization before they are subject to an exclusive collective bargaining agreement. In addition to supporting stronger right-to-work protections for Texas workers, Attorney General Abbott also announced a new initiative to help inform employees about their rights. 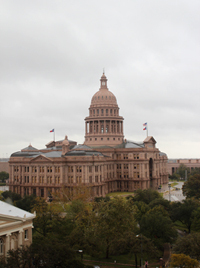 The Attorney General’s Office today released the Texas Workers Bill of Rights, a formal legal notice that outlines the protections employees are guaranteed under existing state law. In 2009, President Obama issued Executive Order 13201, which required all federal contractors to post a mandatory legal notice stating that workers have a right to join a labor union. However, the Executive Order did not also require that employers in right-to-work states notify employees about their right not to join a labor union. While the federal notice is required of all federal contractors, the Texas Workers Bill of Rights imposes no new regulatory requirements on businesses and is instead a voluntary option for employers who wish to inform employees about their legal rights. Attorney General Abbott today encouraged Texas businesses to post the Texas Workers Bill of Rights on their premises. The legal notice, which was developed by the Attorney General’s Office, is available for download on the agency’s website. Texas employers may voluntarily post the Workers Bill of Rights alongside required federal notices in order to ensure employees are fully advised about the State’s right-to-work laws. Today’s publication of the Texas Workers Bill of Rights is the latest of Attorney General Abbott’s efforts to protect and defend the rights guaranteed to employees under state right-to-work laws. In 2011, Attorney General Abbott filed a legal action opposing an attempt by federal labor regulators at the National Labor Relations Board (NLRB) to punish Boeing Co. for expanding its operations in South Carolina – which, like Texas, is a right-to-work state. The legal brief co-authored by Attorney General Abbott and filed on behalf of a 16-state coalition argued that the NLRB’s enforcement action was unlawfully twisting federal law at the behest of labor unions in an improper attempt to favor unionized states over states like Texas, where workers are protected from compulsory union membership. The NLRB’s action, Attorney General Abbott explained, was not only unlawful, but discouraged job creation and economic expansion in the midst of a financial crisis. Attorney General Abbott has also vigorously enforced Texas’s right-to-work laws. In July 2007, Attorney General Abbott charged a national labor union and federal contractors in El Paso and Corpus Christi with violating the State’s right-to-work laws. In those cases, the International Union, Security, Police and Fire Professionals of America and the federal contractors entered into illegal collective bargaining agreements that required all employees to be union members. When individuals employed as security guards at the facilities refused to pay union dues, they were improperly terminated as required by the contractor’s agreement with the labor union. After the Attorney General’s Office filed an enforcement action charging the unions and the federal contractors with violating Texas’s right-to-work laws, the court issued injunctions prohibiting the unions and the contractors from enforcing their illegal collective bargaining agreements.